Your Simple Everyday Approach To Feng Shui Puts The Power Of "The Force"
If you're looking for a way to increase your peace of mind... decrease your level of stress... and effortlessly get into that "zone" where everything just seems to "go your way"... then youve found the right website! There's an ancient way of tapping into hidden forces in the universe that can make your life infinitely easier. And it's not hard to use, not tough to understand. In fact, you can learn all you need to know in about an hour or so. The Ancient Chinese Secret ... That Works Wonders Today! People work harder and have more stress today than they have in decades. The demands of difficult jobs, long commutes, and family combined with the need for adequate sleep, nutrition, exercise and relaxation can wear out even the most energetic people. Alternative practitioners and gurus say that most people live their lives out of balance and that the lack of balance can lead to all kinds of health problems. The ancient Chinese art of Feng Shui is working wonders for people today. And it's not weird or spooky. But hang in there... I'll explain more about what is "is" in a few minutes. First, we need to get clear on why you need a different answer to handling stress in your life. Its true that stress can cause serious problems. Doctors have found a correlation between excessive stress and problems like heart disease, obesity, high blood pressure and other chronic problems like fibromyalgia or chronic fatigue syndrome. Doctors often recommend to patients suffering from these problems that they take steps to reduce the amount of stress in their lives by exercising, eating more nutritious foods and meditating or pursuing hobbies that help them relax. But there's one "secret" that is getting lots of attention these days. One method of dealing with stress and restoring balance that has become much more popular in the last decade is the Chinese art of Feng Shui. And while it's not "new" (just newly discovered by Westerners) and not really a "secret" (at least not to those who are familiar with it)... it is causing a revolution the lives of people who try it. Feng Shui can help improve your health by creating balance in your home, your office, or just about anywhere. Practitioners of Feng Shui say that Feng Shui can be applied to every aspect of your life including the style and décor of your home, where you put your furniture, what jewelry you wear, what color clothing you wear, what type of car you drive, where you live, even what burial plot that you choose. Even though Feng Shui has only been popular in the West for a decade or so its actually an ancient art and science that was created thousands of years ago in China. So Why Does Feng Shui "Work"? The most basic principle of Feng Shui embodies the Asian idea of perfect duality, the yin and the yang. Feng Shui is built upon the Taoist idea of balance and the principles of Astronomy, which represents the Yin aspect and Geography which represents the Yang aspect. In Chinese the characters for the name of Feng Shui translated literally mean the Tao of Heaven and Earth. The principles of Feng Shui are also believed to effect personal relationships, the gathering of wealth, and other areas in which people usually have imbalances that can cause negativity, depression, illness, and failure. To Feng Shui believers the practice of Feng Shui as an everyday science is crucial to finding success in life whether its in business or in relationships with friends and family. Whether you believe the more "spiritual" explanation of Feng Shui, or you simply believe it works for reasons we may not yet understand... doesn't matter. Feng Shui doesn't require that you believe any one particular thing. Once you see that it works, you won't care why. 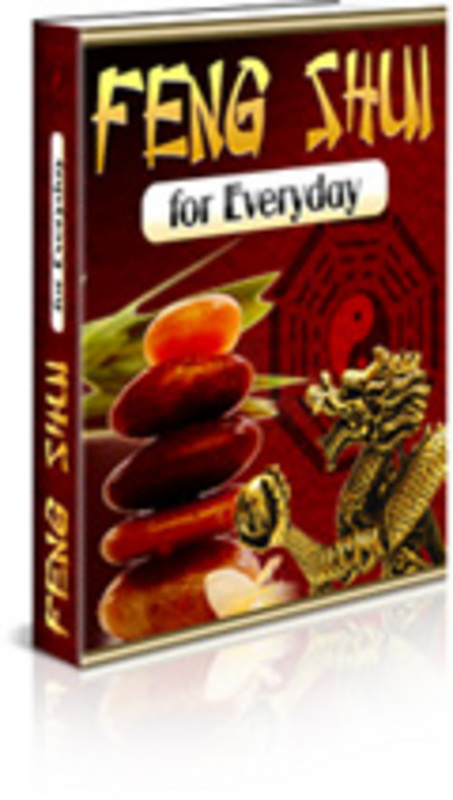 I've taken all I know about Feng Shui and put it into this book - Feng Shui for Everyday. I've broken to down into a small, simple guide. No need to learn esoteric theories. I'll give you just enough information so that you can start putting the power of Feng Shui to work in your own home... business... and life. How to Experience Increased balance Even when your life seems crazy and chaotic and you feel like you cant catch your breath your home will be a peaceful sanctuary where you feel relaxed and balanced. Secrets of Laser Sharp Focus - you will find that you will be able to concentrate more on your work, or on your creative passions at home. These Feng Shui techniques can help you focus more on your life and getting your life in order the way you want it to be. Redecorate Without Spending a Fortune you'll learn to rearrange the furniture in a room or to move objects from one room to another in order to create better flow ... completely change the look and feel of a room without spending a lot of money. Finally Conquer Clutter quickly and easily get rid of all the clutter that is taking up space in your home and interfering with the energy flow of your home or office. Experience a "Health Renewal" When your home (or office, or car) is a sanctuary of balance, harmony and positivity you will start to notice that your stress level goes down. And then you can say goodbye to health problems like headaches, backaches, fatigue, high blood pressure and other problems. Sell Your Home Faster (Even In Today's Market) If youve been trying to sell your home in todays market you might be having a tough time appealing to buyers. But if you use Feng Shui techniques to stage your home then the energy in the home will be positive and cheerful which will make people feel better about the property the minute they walk in. Attract Better People change the energy in your life from being negative and depressing to being positive and happy, which will help you attract positive and happy people. Grow Your Business create a very happy, positive environment that will help your employees be more creative and work harder and will also make your clients and customers feel more at ease and happy. Eliminate Work Stress Using Feng Shui items in your cubicle or your office can really help you feel more positive and fight off all the negativity from the people around you. You will be more productive and you will feel better. Gain Wealth and Prosperity - One of the areas of your life that Feng Shui can really help with is prosperity. According to the principles of Feng Shui when you clear out energy blockages you become more prosperous. This just scratches the surface of what's in the book. I give you everything you need to know about Feng Shui. The real question is: how much is it worth to finally know all the stuff about Feng Shui that you've always wanted to know? I suppose you could do what most people do -- just "make it up as you go", and use the "trial and error" method. Order your copy of the book for just $17 . 1. Downloadable eBook. You can be reading Feng Shui for Everyday in as little as 2 minutes from right now (even if it's 2am on a Sunday!). My automated system will deliver your copy as a downloadable PDF file (which can be read on any computer). You can read the book on your computer, or you can print it out if you like. Try The Book Risk-Free For 8 Full Weeks! There's no need to make up your mind right now. Get your copy of the book. Find out how to experience the power of Feng Shui every day. See if you like it-- if it gives you the information you need and if my simple steps work for you (they will). I don't want you to take any risk at all in ordering this book. So here's what I'm willing to do: you get the book and audio, and put me to the test for EIGHT WEEKS. Simply ask for a refund. I'll give you 100 of your money back. No hassle. No questions. If Feng Shui for Everyday doesn't work for you, I don't want to keep your money. Get your copy of the book right now. Just ask for a refund and I'll send you every penny of your money back. It's that simple, and the risk is 100 on my part... not yours.